Book your Cabo San Lucas Snorkeling Tour! Discover in our small group the underwater world of Lands’ end and Pelicans Rock with this incredible Snorkeling tour in Cabo San Lucas. Jacque Cousteau, the Inventor of Diving and world-famous Ocean Explorer, described the Sea of Cortes as the Aquarium of the World with an enormous variety in species of Tropical Fish and unprecedented Ocean Flora and Fauna. Dive in and snorkel inside the aquarium of the world discovering many types of colorful Tropical Fish and Marine Life. 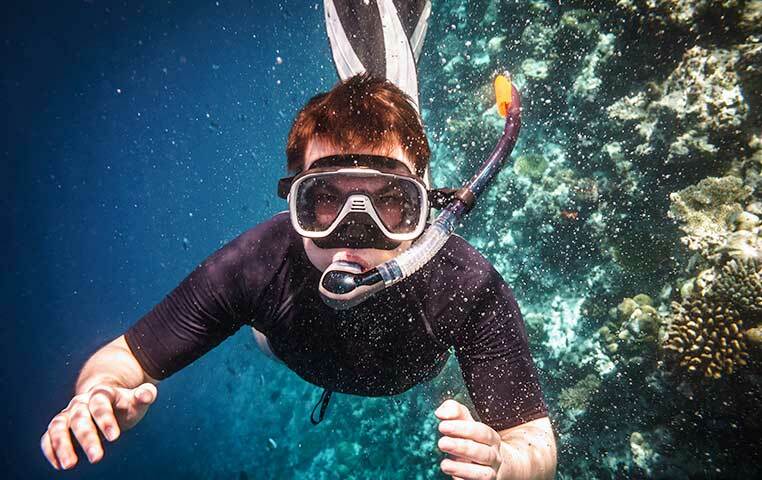 You will be accompanied and kept safe always by an experienced and certified Snorkel Guide that will take Incredible Underwater Photos for you without extra charge. If you are looking for a Snorkel Experience in Los Cabos this is Your best option. This very popular snorkeling tour is of Incredible value, it includes roundtrip transportation, boat ride, snorkel gear, Free Photo CD, Free Souvenir Snorkel Tube, Certified Guides, free beach time or shopping time after your snorkel adventure, bottled water, a delightful Box Lunch for the in between hunger and incredible memories that you can share on Social Media with your loved ones, all included in this Fantastic Adventure.